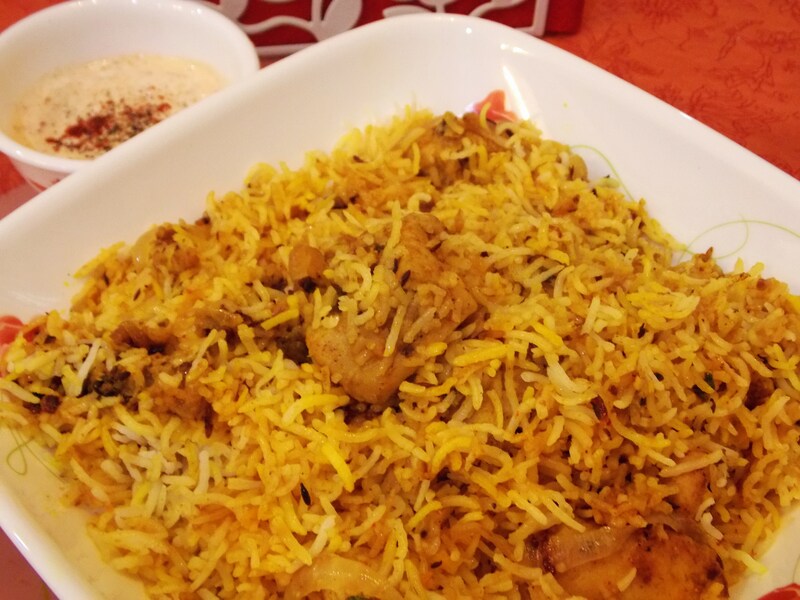 Delectable and Sumptuous Chicken Dum Biryani. A rice-based dish made with spices, basmati rice and chicken. Cut chicken into 1.5 inch pieces. Marinate it with mustard oil, 1/2 teaspoon garam masala, 1 tablespoon chopped ginger, 1 tablespoon chopped garlic, lemon juice and natural yogurt for min. 45 mins. (for best results marinate the chicken and keep in the refrigerator for 6-8 hrs. before cooking). Take the chicken out from the refrigerator 30 minutes before cooking and add salt and mix well. Boil rice with 1 teaspoon of salt, 2 teaspoons of cooking oil, 2 black and 2 green cardamoms. Keep stirring the rice at intervals so that it gets uniformly cooked. Cook only till it’s 3/4th done (very essential). Drain and keep aside. Heat 2 tablespoons of ghee (clarified butter) in a big kadhai (pan). Add cumin seeds, 2 green cardamoms and 2 cloves. After a minute add onion rings and sauté till lightly browned. Add the remaining chopped ginger and garlic and sauté for a minute. Then add 1 teaspoon turmeric powder, red chilli powder, biryani masala and salt to taste and continue to sauté for three to four minutes. Remove half of this mix and keep aside. Now add marinated chicken to the remaining mix in the pan and cook on medium flame for 5-7 minutes. Stir at intervals. After the chicken is 3/4th cooked, bring the flame to low, add half of the chopped coriander, half of the mint leaves, broken green chillies and give a stir. Put 1 tablespoon of ghee (clarified butter) all over and mix. Now layer half of the rice evenly on top of this. Layer the onions (which were set aside), remaining chopped coriander and mint leaves evenly on top of the rice. Put 1 tablespoons of ghee (clarified butter) all over and sprinkle garam masala. Layer the remaining rice evenly on this. Sprinkle rose water drops. Mix 1 teaspoon haldi (turmeric) powder with 2 tablespoons of water and pour on top of this and cover the pan and cook for another 5-7 minutes. After 5-7 minutes, slide a spoon from side of the rice and check if the chicken is cooked or not. If the mixture down is sticking to the pan, then keep a tawa (griddle) under the pan and continue cooking until the chicken is cooked well. Check salt, add if required. Stir the biryani. Season with green chillies and mint leaves and serve hot with lemon wedges, onion rings and raita (Indian dip made with natural yogurt). Enjoy your plate of chicken biryani with a soft drink alongside for a perfect meal. Lovely sounding recipe – thanks for sharing it with us at Fiesta Friday! What Chicken Biryani Powder Brand did you use?